If you are curious about quinoa and ever wondered if they contain gluten or not, well, we’ll be answering this in detail in this post. Yes, quinoa is technically gluten-free, and if you are gluten intolerant, it is a good choice for your nutrition for many reasons. Quinoa (pronounce as ‘ keen-wah’) is not classified as a cereal but a “pseudocereal” seed used by many as a gluten-free diet recipe. It is a great alternative for cereals which contain gluten. They are nutritionally dense whole grains and give a higher amount of antioxidants than many other common grains. Quinoa is one of the few plant-based foods that are considered as a complete protein. That implies that it contains all nine essential amino acids needed to be considered a complete protein. Its seeds are excellent sources of vitamins and minerals that make it an excellent dietary choice. Quinoa is a whole food that has apparently all nutrients packed in each seed. This powerhouse of the grain houses a host of nutrients which are essential for daily use in man. Many people in the bid of staying fit and even losing weight try so hard to ensure that they are eating clean with the minimum calories in the plate. So you may want to know if quinoa is energy dense or not. Quinoa is not overly loaded with calories. 100 grams of quinoa contains only about 120 kilojoules of calorie. Quinoa does not have excess calories. This is another reason why they are considered very recommendable for weight loss and to be incorporated in the regular normal diets. Quinoa though rich in carbohydrates (being plant-based) is having a low glycemic index. Glycemic index of foods reveals how a food is able to spike up blood glucose levels and how they affect the health of an individual. Quinoa on this note is having a low glycemic index. This implies that it does not raise the blood glucose rapidly, and prevents the risk of diabetes, obesity and other diseases. The fiber content in quinoa has made them preferable cereal options for weight loss diets. Quinoa is rich in fiber which helps an individual fill fuller for longer. The fibers in quinoa are mostly insoluble in nature. Insoluble fibers have also been linked to preventing and managing diabetes. These insoluble fibers are also beneficial to the friendly bacteria in the gut. The fibers are able to be fermented and used as feed for the gut flora in the body and to improve the overall health. Quinoa Is A Rich Protein source. Quinoa is tagged as a complete protein because it is packed with the good benefits of all essential proteins. Essential proteins are constituted of the essential amino acids. This marks a food type as a complete protein. Quinoas are exceptionally high in lysine. Lysine is not readily available in many plant-based foods. They are equally good sources of methionine and histidine. These and many other amino acids make quinoa preferable protein-rich foods. 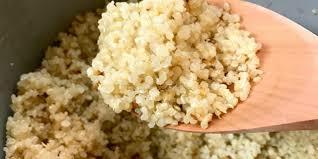 The protein quality of quinoa is similar to that of milk’s casein. The presence of all the essential amino acids in quinoa makes them rank among the league of complete proteins. Below is a list of nutrients and their values present in quinoa. Quinoa contains a good amount of fat. Yes, fats, you saw that. Quinoas are a host for healthy fat. Most of the fats in quinoa are unsaturated in nature. Only a little fraction of the fat in quinoa is saturated fat. Quinoa is filled with the goodness of minerals and vitamins. They are an excellent source of antioxidants due to the presence of minerals and vitamins in the pseudo-cereal. Other plant nutrients like saponin, oxalate, phytic acid, squalene (an antioxidant and a precursor for steroids in the body) are found in quinoa. according to a publication from Healthline, a nutritional value for a 100g quinoa is given below. Quinoa contains more minerals than most cereals and plant products. see more here. It has many properties that qualify it to be recommended for weight loss. Due to the rich fiber contents in quinoa, a person is able to control their eating habit as they help a person to stay full for longer. Quinoas are also high in proteins which help to control satiety and boost metabolism. Proteins are the basic building blocks for our muscles and are not rapidly digested. Hence they also prolong satiety and feelings of fullness. They, in turn, help to prevent obesity. Quinoa is able to reduce a high blood pressure by the reason of their high fiber contents. They are able to prevent heart diseases by lowering a high blood pressure. Quinoa has a low glycemic index which manages the levels of the blood glucose. A low glycemic index food when consumed helps the glucose to be released slowly into the bloodstreams. This prevents the risk of diabetes and other health complications. Quinoa has a relatively low glycemic index compared to other cereals like wheat and rice. Quinoa is technically gluten-free in nature and is best for celiac disease. Patients suffering from celiac disease are not able to tolerate gluten which is a type of proteins present in most cereals. Cereals like wheat, rice, and barley contain gluten. This makes them unfit for celiac patients. Quinoa is just a right food recommendation for people with celiac. gluten free society has this to say. 5. Great for pre and post workout meals. Quinoa is an excellent carbohydrate, protein and fiber source, which releases energy steadily during a workout and provide healing for sore muscles post workout. A hundred gram quinoa contains close to 5grams of protein, and it is the only carbohydrate source with a complete protein (containing all 9 essential amino acids). Quinoa has the ability to heal sore muscles post work out. This is chiefly responsible by the presence of the amino acid, lysine. Hence, quinoas are highly recommended as post workout meals too. These days, quinoa is used in varieties of ways. They are processed mostly processed into flour forms and used to make different varieties of pasta, cookies, bread, and other breakfast cereals. 1. Due to the fact that quinoa is often times grown and harvested alongside barley, wheat, and rye, there is a high probability for cross contacts between these grains. Also, storage facilities and processing mills sometimes cause a contamination of quinoa to be a gluten carrier. This, in turn, makes the gluten-free property of quinoa questionable. This could be detrimental to celiac disease patients. 2. The presence of phytate, an antinutrient which prevents the absorption of nutrients like zinc and iron, can be removed simply by the soaking process. 3. Saponins are naturally present on the quinoa seeds which help push away pests from eating up the plant in the farm. Saponin gives the seed a bitter taste but can be removed simply by rinsing or washing the grains before use. 4. Oxalates are found to be present in quinoa as well. Oxalates when in contact with calcium form calcium oxalate which causes kidney stones. 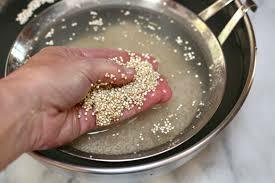 But there is no fear, as research has it proven that oxalates are ridden off in quinoa by rinsing and soaking pseudocereal before used it is used in cooking. Quinoa is a safe gluten-free plant-based food and recommendable for people with celiac disease (leaky guts). It is higher in nutrients than most other grains. It is an excellent source of protein and also a complete protein source (has all nine essential amino acids). It contains some great amounts of vitamins, minerals, and other plant compounds. Quinoa has a high antioxidant level, thereby helping fight free radicals and preventing diseases. It has antioxidant levels higher than most cereals and grains alike. Quinoa help to improve weight loss and lower blood sugar levels due to its high fiber, protein, and low glycemic index contents. The grains have certain antinutrients naturally present in them but are easily eliminated by simply rinsing and soaking the grains.